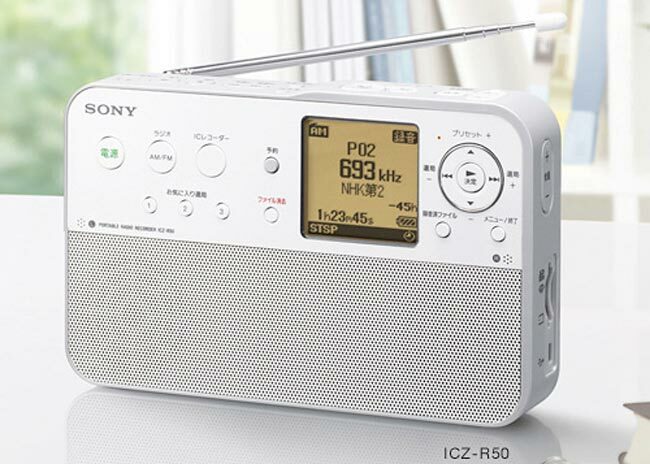 Sony has announced the Sony ICZ-R50 Radio Recorder, which will go on sale in Japan, and it is basically an AM/FM radio with 4GB of built in memory, although this can be upgraded to 32GB with a new SD card. The Sony ICZ-R50 Radio Recorder will let you record your favourite radio shows, it can also be used as a voice recorder and it is compatible with both MP3 and WMA files. The Sony ICZ-R50 Radio Recorder can be connected to a PC via USB so that you can easily transfer your recordings to your computer. It looks like the Sony ICZ-R50 Radio Recorder will only be available in Japan, and it will go on sale on the 21st of February for $218.